Cached Resolution is an experimental feature of sbt added since 0.13.7 to address the scalability performance of dependency resolution. A project declares its own library dependency using libraryDependencies setting. The libraries you added also bring in their transitive dependencies. For example, your project may depend on dispatch-core 0.11.2; dispatch-core 0.11.2 depends on async-http-client 1.8.10; async-http-client 1.8.10 depends on netty 3.9.2.Final, and so forth. If we think of each library to be a node with arrows going out to dependent nodes, we can think of the entire dependencies to be a graph — specifically a directed acyclic graph. This graph-like structure, which was adopted from Apache Ivy, allows us to define override rules and exclusions transitively, but as the number of the node increases, the time it takes to resolve dependencies grows significantly. See Motivation section later in this page for the full description. The Cached Resolution feature is akin to incremental compilation, which only recompiles the sources that have been changed since the last compile. Unlike the Scala compiler, Ivy does not have the concept of separate compilation, so that needed to be implemented. Instead of resolving the full dependency graph, the Cached Resolution feature creates minigraphs — one for each direct dependency appearing in all related subprojects. These minigraphs are resolved using Ivy’s resolution engine, and the result is stored locally under ~/.sbt/1.0/dependency/ (or what’s specified by sbt.dependency.base flag) shared across all builds. 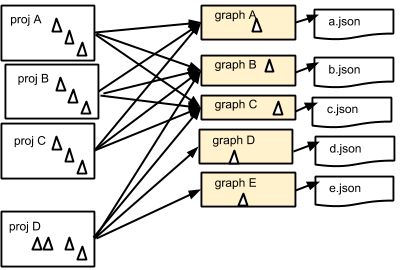 After all minigraphs are resolved, they are stitched together by applying the conflict resolution algorithm (typically picking the latest version). When you add a new library to your project, Cached Resolution feature will check for the minigraph files under ~/.sbt/1.0/dependency/ and load the previously resolved nodes, which incurs negligible I/O overhead, and only resolve the newly added library. The intended performance improvement is that the second and third subprojects can take advantage of the resolved minigraphs from the first one and avoid duplicated work. The following figure illustrates projects A, B, and C, all hitting the same set of json files. The actual speedup will vary case by case, but you should see significant speedup if you have many subprojects. An initial report from a user showed a change from 260s to 25s. Your mileage may vary. Cached Resolution is an experimental feature, and you might run into some issues. When you see them please report to GitHub Issue or sbt-dev list. The first time you run, Cached Resolution will likely be slow since it needs to resolve all minigraphs and save the result into the filesystem. Whenever you add a new node the system has not seen, it will save the minigraph. The second run onwards should be faster, but comparing full-resolution update with second run onwards might not be a fair comparison. There are also some issues around multiple dependencies to the same library with different Maven classifiers. In these cases, reproducing the exact result as normal update may not make sense or is downright impossible. A setting key called updateOptions customizes the details of managed dependency resolution with the update task. One of its flags is called lastestSnapshots, which controls the behavior of the chained resolver. Up until 0.13.6, sbt was picking the first -SNAPSHOT revision it found along the chain. When latestSnapshots is enabled (default: true), it will look into all resolvers on the chain, and compare them using the publish date. updateOptions can also be used to enable consolidated resolution for update task. This feature is specifically designed to address Ivy resolution being slow for multi-module projects. Consolidated resolution aims to fix this issue by artificially constructing an Ivy dependency graph for the unique managed dependencies. If two subprojects introduce identical external dependencies, both subprojects should consolidate to the same graph, and therefore resolve immediately for the second update. Of the above factors, the one that has the most impact is the number of transitive nodes. The more nodes there are the greater the chance of version conflicts. Conflicts are resolved typically by picking the latest version within the same library. The more nodes there are, the more it needs to backtrack to check for exclusion and override rules. Exclusion and override rules are applied transitively, so any time a new node is introduced to the graph it needs to check its parent node’s rules, its grandparent node’s rules, great-grandparent node’s rules, etc. sbt treats configurations and subprojects to be independent dependency graph. This allows us to include arbitrary libraries for different configurations and subprojects, but if the dependency resolution is slow, the linear scaling starts to hurt. There have been prior efforts to cache the result of library dependencies, but it still resulted in full resolution when libraryDependencies has changed.